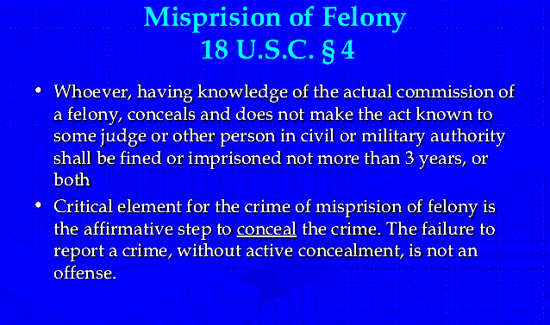 “Misprision of a felony,” involves concealing a crime through false statements and withholding pertinent information to authorities while continuing to provide assistance to those involved in the plot. There are all kinds of circumstances where these charges apply but for the time being we’re talking about a bizarre plot to break an inmate out of the Furnas County Jail in Nebraska and kidnap the local sheriff and a judge. The guy that was charged is the president of the Arapahoe, Nebraska, airport board- one Anthony Todd Weverka, 55. By agreeing to the pretrial diversion Weverka has admitted to his involvement in the criminal conspiracy. Now, if he’s a good boy, Weverka just gets a slap on the wrist. He got 18 months probation and has to do 50 hours of community service. Weverka will see all the charges against him dismissed if he meets those requirements.